Our fast pitch booth is another popular attraction. 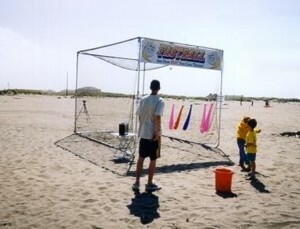 It uses a radar gun to measure the speed that someone throws a baseball. The speed of every pitch is immediately displayed on a 12 x 18 inch screen. It's also a great tool for little league and softball teams who want to improve their pitching skills. Pitching contests are always popular. You can have different categories of participants, and the fastest pitch in each category at the end of the day gets a prize. 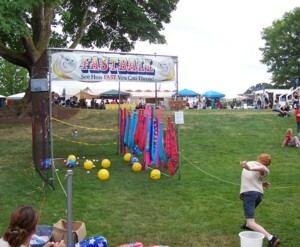 The competition is hot and emotions run high at the fast pitch booth! 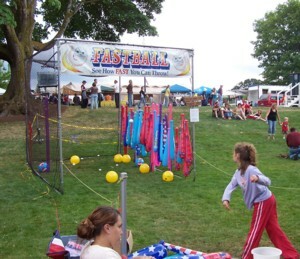 You may want to download Fast Pitch Booth Space Requirements and Safety in PDF format.